Emma Cane introduces a new series with At Fairfield Orchard. 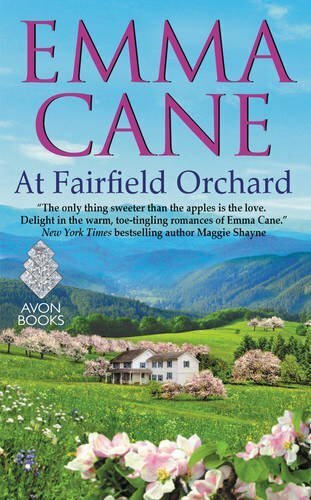 The six Fairfield siblings join forces to keep the family apple orchard going when their parents retire. The orchard is located in the Blue Ridge Mountains near Charlottesville, Virginia. Although only Rachel has worked in the orchard as an adult, all of them have emotional ties to the land that has been in their family for almost two hundred years. Logan, the eldest and a successful venture capitalist, bought the RV that allowed the Fairfield parents to fulfill their adventurous dreams and invested in the orchard, although his siblings insist his investment is a loan that will be repaid when the orchard becomes more prosperous. The other Fairfield siblings are investing their time and labor in seeing the prosperity become a reality as they try to bring their centuries-old orchard into the twenty-first century. In this first book, Amy has returned after ten years, leaving behind her a promising career in real estate, a failed relationship, and a load of regrets about the distance that relationship created between her and her family, including her twin brother Tyler, and between her and her long-time friends. Her guilt over staying in the relationship too long and in the isolation she allowed to happen cause her to give up on her interest in history and genealogy to focus on the future of the orchard. At first, she is uneasy with the request of a young history professor to be allowed to conduct research on Fairfield land. Jonathan Gebhart, a history professor at the University of Virginia, is interested in the orchard because of its link to Thomas Jefferson. Jonathan believes that Jefferson sold the land to the first Fairfield owners and that it was to the orchard Jefferson fled when he was forced to leave Monticello to escape British forces during the American Revolution. If Jonathan can find evidence to support his theory, it will be a major coup for the book he is working on because it will upset the acceptance of Poplar Forest as Jefferson’s destination. Jonathan needs the permission of the Fairfields to research the site. He also finds in Amy’s grandfather, a history buff with an abiding interest in Fairfield family history, an unexpected resource. On the personal level, Jonathan is still smarting over being dumped by his fiancée in favor of his best friend and on the resulting awkwardness for his career, given that they are all on the same faculty. Jonathan and Amy are attracted to one another immediately, but neither is looking for a romantic relationship. Amy is particularly aware of their differences. Despite her success as a real estate agent, she sees herself as a college dropout and counts her education as one more sacrifice to her ill-advised relationship with her ex. And, of course, Amy’s experience as part of the large, lively Fairfield family is very different from Jonathan’s only child status. Jonathan, whose prodigious intelligence led his parents to expect great things of him, is burdened with the knowledge that they view his academic career with disappointment. Regardless of these differences, however, the two are similar in their values and in their approach to life. Their relationship develops gradually and credibly as their lives entwine with Amy’s family and community. The first book in a series needs to hook the reader on the world the author is creating as well as make the protagonists’ story compelling. Cane succeeds on both counts. Both the setting and the rural community make this novel a standout among the seemingly endless supply of too-similar small-town romances. The other Fairfields are integrated into Amy’s story in an organic fashion without ever giving the impression that they are card-carrying sequel bait. The American history connection and the Fairfield genealogy add unexpected layers to the story. I liked these characters. I loved the history professor hero, and while Amy’s big secret became more irritating than fascinating, I found her too to be essentially a sympathetic and interesting character. I especially liked the dimensions that are revealed through her relationship with her twin, her grandparents, and her girlfriends as well as through the romance. The secondary characters are also likeable, and even the Fairfields who get little attention are appealing enough to leave me eager for their stories. If you like your romance quiet and sweet with a touch of spice, I recommend this book. Don’t be surprised if you fall in love with the Virginia setting and the Fairfield family and turn the last page asking yourself “What’s next?” I’ve already added Spiced Apple Winter (December 27), twin Tyler’s story, to my book calendar. I also hope the cover for the second book is a match for the cover of At Fairfield Orchard. Gorgeous! I love reading about people who enjoy looking into American history in the early years. I will have to give this book a try. Thank you for the review. I'm really looking forward to this one--it's on its way to the library for pickup! Pamela and Nikki, I think it is a promising start to a new series. I'm looking forward to more about the Fairfields.